Ever wonder how companies get their names? Older companies usually have descriptive names while newer ones have names generated by marketing departments. A name like National Can describes what the company did well. A name like Accenture means nothing, and says nothing about what its employees do. Sometimes a company moves beyond their name, this is the case with the National Stock Yards (NSYC) company. Based on the name National Stock Yards should be doing something with cattle, and they do. The company owns two subsidiaries, the Oklahoma National Stockyards, and the St Louis National Stockyards. The St Louis Stockyards closed in the late 1990s due to declining cattle volume, while the Oklahoma stockyards are still in operation. If National Stockyards were simply a cattle operation it would be easy to pull national beef pricing data and expectations and estimate a value for the company. Fortunately there is more to the story. What makes National Stockyards interesting is the small set of businesses they own and operate. The company runs the namesake livestock auction, a livestock warehouse rental business, office rentals, a legacy holding in a railroad, an equity interest in a golf course, and a large real estate development interest. From what I could tell the railroad is defunct and exists in name only, but they still claim an ownership interest. The company's cattle operations provide the top live revenue, but the livestock operations don't totally cover their cost. Over the past two years the company has lost money on their livestock and livestock real estate operations. In 2009 the company made a slight profit. The company's auction operations profitability is closely linked to cattle sales. The auction house gets a cut of each animal sold, fewer animals auctioned means lower revenues. 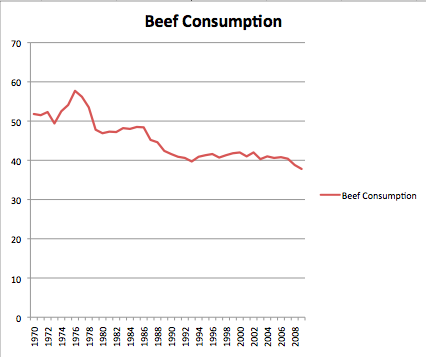 It doesn't help National Stock Yards that American beef consumption has been falling since 1970. Beef consumption is to levels that haven't been since in the last 40 years; as Americans cut the red meat National Stock Yards suffers. The following chart illustrates very well why National Stock Yards was able to have multiple facilities for years, and then why they eventually closed one, and run the other two days a week. The interesting twist with National Stock Yards is what appears to be a cattle story is more of a real estate story. The company closed down their St Louis stock yards in the late 1990s which left them with close to 600 acres of developable real estate. Since the 1990s the company has developed and sold off more than half of that real estate. A portion of the real estate was swapped for an equity interest in a golf course located on their land. The golf course is held on the books at $0. Any savvy investor can recognize that even a money losing golf course has a value of more than $0. The company's land is located in or right near the blue circle with "3" on both sides, to the left of the "Fairmont City" label. For the bridge to be completed the highway has been re-aligned and new interchanges built, one exit will provide ready access to the company's real estate. The new bridge and connections should be open to traffic in 2014. All of this is to say that the portion of undeveloped real estate left is highly salable, and is in a desirable location. Some readers (most from the MidWest) will dispute my last sentence citing the proximity to East St Louis. Painting with a broad brush, East St Louis is a very depressed and crime-ridden city, and real estate in East St Louis is about as valuable as real estate in the inner city of Detroit. I initially wrote off the value of the company's land when I read where it was located until I took a look on Google Maps. The company's real estate is a few miles outside of the ghetto-ish area, and abuts farmland. The Illinois side of St Louis turns rural very quickly as one travels away from the Mississippi. The first value is the current book value of the property, $12,242 per acre. The last two prices are actual comps in the area, the middle two numbers are values at which the company has sold pieces of the land to the state. One 10 acre plot went for $247,000, and a three acre plot went for $107,000, both sales were in the past two years. Sometimes real estate companies can end up with pie in the sky valuations when the price of one valuable piece of property is extrapolated out to the rest of the holdings. A situation like that is possible with National Stock Yards, but I found a line in the annual report to be reassuring in this regard: "Management estimates that the fair value of the Company's St. Louis real estate is in excess of its carrying value and demolition costs.."
The best way to value National Stock Yards is on a sum of the parts basis. The stockyards themselves throw off a few hundred thousand in operating cash flow a year, and have a book value of about $4m. I have no idea what a stockyard could be worth to a buyer, if there are any, so I'll just take book value at face value. The company's share of the golf course is worth something although an exact value is probably impossible to obtain considering the carrying cost is zero. The golf course is an equity investment, and unfortunately the annual report doesn't have a statement of equity. There are a few lines showing beginning equity, dividends accrued and ending equity. If the golf course is the only equity investment then they're accounting for a $100-$300k change in equity per year. Maybe the interest is worth $500k, or maybe a million, either way it's a bonus to the valuation. The final piece is the real estate holdings in East St Louis. If we assume all of the land is worth the lowest price IDOT paid it's worth $6.5m, double the carrying cost. Add up $4m, $6.5m and $1m and the company is potentially worth $11.5m. Given that their market cap is currently $7.2m I'd say they're trading at a sizable discount. If the company can sell any of their holdings for more than $25k an acre the valuation quickly becomes more appealing. Lastly it's worth noting that in the past when the company has sold real estate holdings they generally pay out almost all of the proceeds as a dividend. They paid a $35 p/s dividend in 2009 and a $12 p/s dividend in 2010. I won't speculate on what future dividends could be, but they could be large. If you're looking for more information on National Stock Yards you'll need to buy a share for $166 and call the Treasurer with proof of ownership for a copy of their latest annual report. Of course financial information is available on Unlistedstocks.net along with details on 68 other unlisted companies as well. Disclosure: I own one share as a tracker position. IDOT is a historically notorious overpayer of real estate. I know an old farmer in northeast Illinois who got rich selling them his farmland. Unless they're going to be the buyers of the remaining acres, be very careful using them as the basis for a land valuation. East st. Louis is a shithole. Pure and simple. And iI travel through west chicago twice a day so I know what a shithole looks like. I've driven through that area on I-55 probably a dozen times and there is no reason to get off the interstate once you get passed the I-255 exit and before you hit the river. 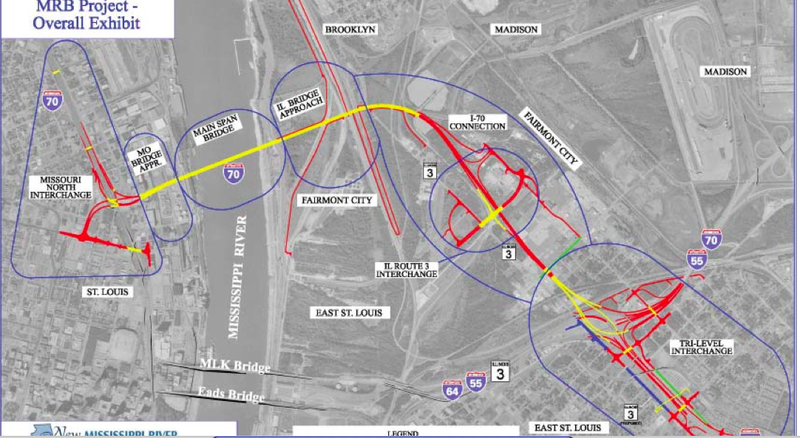 Downtown St. Louis is right there and so are the affluent suburbs on both sides of the Mississippi, so that area of east St. Louis serves no purpose other than to harbor pollution and keep the criminals away from the nice neighborhoods. It wouldn't even be particularly attractive for gas stations and stores because of the fact that its on the Illinois side of the border, where everything is more expensive. Gas is at least 30 or 40 cents more expensive, cigarrettes are 20 dollars more per carton. I cannot see developers chomping at the bit to get at this land. There isn't as much margin of safety as I was expecting there to be before I got to your valuation section. I was expecting the sum of the parts to be at least twice the current price. I could be misjudging this since I've only travelled through the area, but I think mr. Market has done a decent job of pricing this one. Thanks for the comment. I've been through the area as well, but it was about 10 years ago, so your experience is much more current. Is the land National Stock Yards owns right next to East St. Louis? It looked on Google Maps that it was out a little bit, enough that there was buffer between the junky areas and their land. But you do raise some good points, who would locate there, and if the area is bad there is probably a lot of real estate selling cheaply in the area. I don't know squat about IDOT, but I do know it seems like the company got a sweet deal. They sold a few parcels and IDOT is clearing the remaining land and running complete utilities to the unsold parcels. Nate, let me clarify some things, I typed that quickly on my tablet as you can probably tell from the grammar. I agree that it is buffered from the nasty areas but my point was more that east St. Louis and all the heavy industry in that area would keep this area from really ever becoming anything more than empty farm ground connecting interstates. I can't see developers going there, particularly with all the shopping/lodging/activities in St. Louis and the nearby suburbs. If you ever drive from Springfield Illinois to St. Louis on i-55 you'll notice that there is almost nothing in between besides farm land, just a few gas stations/truck stops and maybe a couple of dairy queens. I think this is what the area will stick to being. Even if development does get there, that kind of thing takes years or decades in huge rapidly expanding cities/suburbs, of which St. Louis is not. I could be wrong, don't take anything I'm saying as gospel, I just want to point out that this land might not be as highly salable as you think. One thing I know for sure, using IDOT (or any Illinois government agency, save maybe cook county forest preserve) as a peer comp is NOT a safe or even fair assumption. Hell, using recent farm land prices as a comp might not even be a safe assumption given the likely bubble in midwestern farm ground and corn prices. Anyways, if this stock was at a $3 million market cap then I would probably take a trip down there next weekend and scout things out. But given the price, the liquidity (building even a modest position would probably push the price up quite a bit), and all the implicit assumptions that must be made in the valuation, I have little interest. Hester, I don't think you fully understand the recent history of that land and it's potential on a commercial basis. I say that primarily because there has been some very big investments made in the area evidenced by the golf course and the racetrack. I'm not here to say that there is ever going to be wealthy residential developement or shopping center built there but to say that the land's sole purpose is to harbor pollution and contain crime is incorrect. Yes, I am aware that there were some environment clean up costs years ago but it's my understanding that is water under the bridge. Also while IL does have some higher costs with gas etc., that hasn't stopped a pretty massive buildup of nice residential communities over the past twenty years, as you alluded too. hey, the area has some problems, no question about that and I think you absolutly correct that this isn't some kind of get rich quick scheme, I'm just saying I think you are being a little to negative on the prospects. They do have a pretty good, if erratic, dividend history over the past decade. I took a pass on them a few times because I was worried about cash outflow, but I'm likely poorer for it. In absence of other markers it's good to look at management history, and they've done well for shareholders. On a separate note, have you ever come across RTYFZ? It's a delisted RE bubble casualty; not wholly dissimilar to ECRO. At last public report--April 2012--it had 14 cents in cash/share (vs. current ~13 cent share price), basically no recourse liabilities, and a dog's breakfast of underwater assets and possibly-uncollectible lawsuit judgments. One of these is its JV interest in 1515 Market, a well-located Philadelphia office building. The $70 million mortgage on this property matured in January and was just purchased by Winthrop (FUR--odd ticker) for $56.85 million. RTYFZ had invested $16.5 in the JV and written it down to $2.2 million, which value would be supported by the mortgage purchase, though there's no telling whether RTYFZ would see any of it. The written-down value of the property, if realized, would add 7 cents and change to the co's cash/share,. Perhaps of mild interest, though there's not necessarily a screaming margin of safety apparent. The new road construction in the area has the effect of further isolating NSYC land from the problem areas of East Saint Louis. The land will be served by the first exit off the interstate on the East side of the river when traveling fro Saint Louis proper. If new development could be started there, it could grow on itself and create an island of prosperity in a depressed area.